sock prØn. : sherwood sweater... finished? From what I can see it looks good on him. I mean, you're already planning a tshirt right? And you want a bit of it to show anyway. Keeps idiots from me wondering how a tshirt neck got sewed onto a sweater, doh. I don't think you need to change it at all. I didn't notice the somewhat-boatneck until you pointed it out, and the more I scroll through the pics, the cuter and cuter it is. It's adorable. 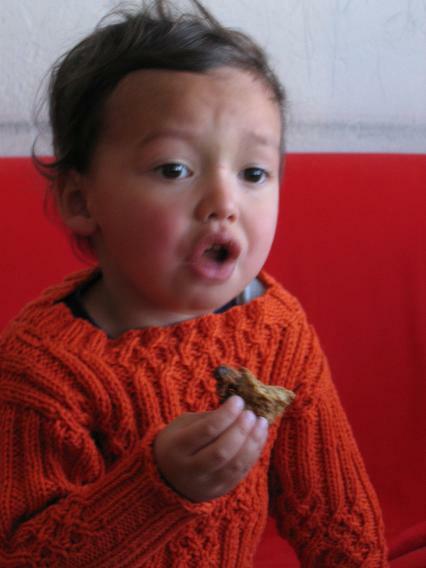 He looks so cute with the cookie and the beautiful sweater! Awwww. 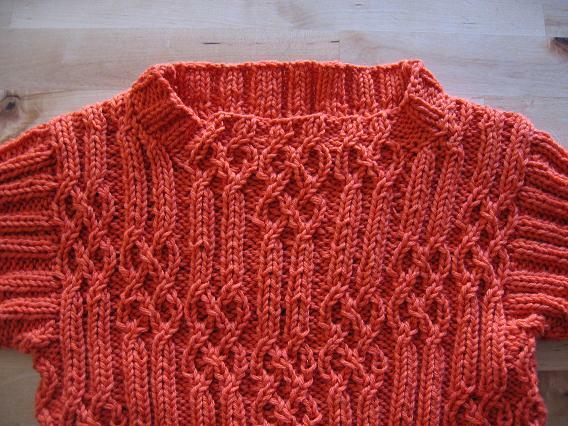 If I was going to mess with it (which I'm not sure you should), I'd go for smaller needles for the neck ribbing. Or the decrease idea along the sides. That would probably be the easiest, and I'm all for easy. it definitely looks good with the altered neckline - as is. of course, little things like that don't bother me. if you MUST, then i would go with option #3, since cotton tends to stretch with wear and in my opinion would make the bigger difference in neckline non-openness. looks good!!! so does the cookie. YUM! your Sherwood is adorable- but more so on the kid!! It looks fantastic! what a great sweater. It looks good on him, he is so cute, he could wear a toga and it would look just adorable on him ;)I do think the pattern pic is kind of odd looking on the neck and the way they "posed" it sort of hides it but it is still cute. I bet you'll tinker with it till you get it the way you want it but it does look pretty cute on him the way it is. If you do decide to change anything, then I really agree with Cookie. 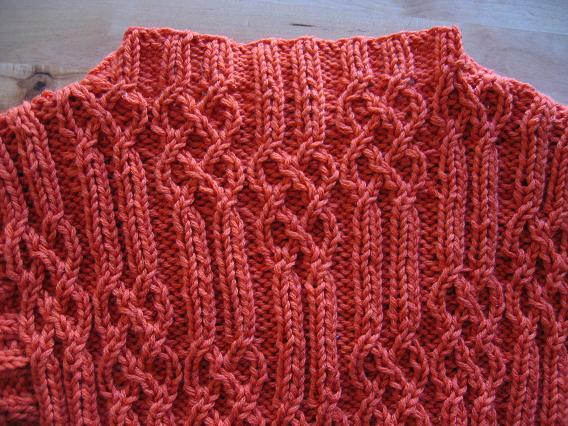 The pattern pic necklines do look "boaty". 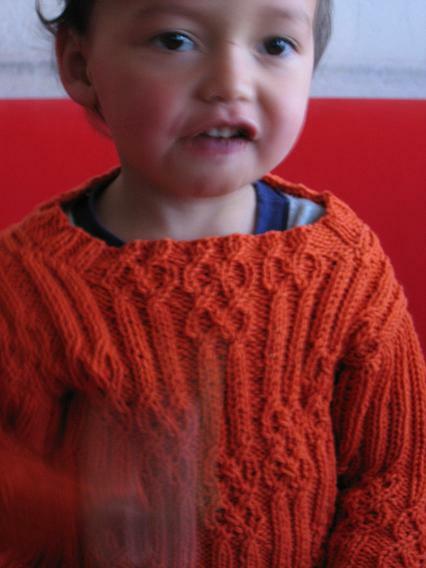 I made the mistake on a sweater I made for my first son when he was about that age of making the neck too tight. I could barely squeeze it over his head, and I think it only got used once. Now it's destined to go to some (hopefully small-headed) Mongolian child for the Dulaan Project! I think it looks great! Love that orange color. 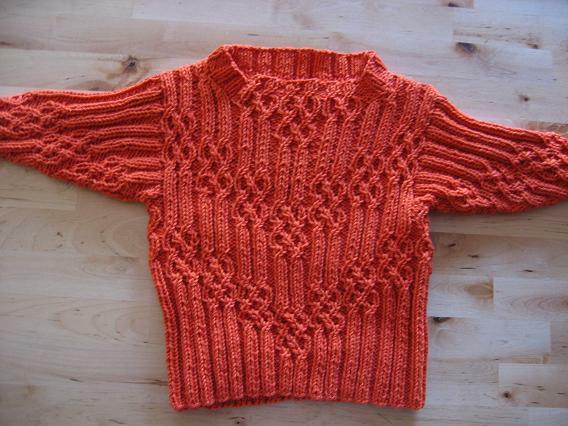 And I think you're right, the original one in Knitty looks sort of boatnecky too. I personally think it looks good as is, but if you're going to fiddle with it I would third cookie's opinion about the smaller needles. 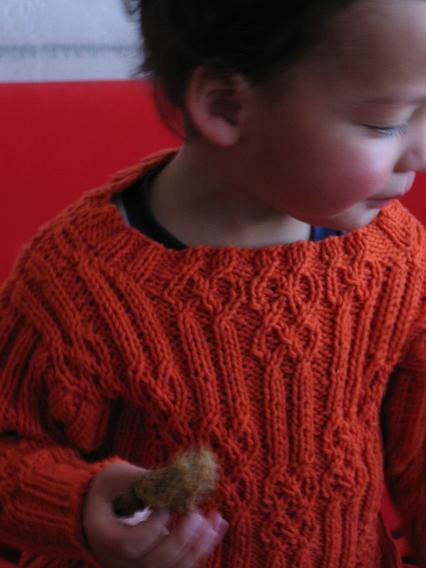 Your comment about your son begging to take the sweater off reminded me of a story my mother told me, I don't remember this at all, but she used to sew me a lot of clothes when I was little and she made me what sounded like an adorable but possibly itchy matching wool skirt and vest set when I was about 3. She put it on me and we were going to do errands somewhere when I suddenly stopped by a trash can in the parking lot, pulled off the vest and threw it in the can, and shouted, "garbage!". My mom left it there because she figured if I felt that strongly about it she would never get me to put it on again. What a little ingrate I was. The sweater turned out great! I think the neckline looks fine, especially with a shirt underneath. I agree with Cookie's advice if you're going to futz with it, though. And I love the bright orange, very cool! Constant motion, eh? I think the sweater looks great on him. I wouldn't change a thing. He's pretty cute too, btw. I didn't notice the neck til you said something. I say leave it. Re: feeling old....I read a book recently where it made mention of taking a cassette tape and putting a piece of scotch tape over the hole to record over what was originally on it. I felt REALLY old that I remembered that and that I used to do it myself. Sigh. Gosh darn that kid is cute! Love the sweater...don't change a thing! When you say he hated it and begged you to take it off, was he saying, "The neckline isn't right!"? Because if he wasn't, I wouldn't mess with it. The one on Knitty seems like it was the same, just captured from different angles and perhaps the kid was on 'ludes or something. And babies do have big heads. Personally, I noticed what you're saying about the neckline, but I really don't know how I'd fix it (see big head issue above). I mean, the cabling probably drew the fabric in just as much as ribbing would have, right? And it's the sides of the neck that are out too far. Looks great! Nice work but bummer he doesn't like it! I had to laugh after reading some of these comments about feeling old. Keep in mind that this happened several years ago when I was still driving around in my first car. I just needed it to get from a to b so nothing too fancy. I picked up my younger cousin for an outing (in summer) and she looked over at me with a bewildered look on her face. That particular car had the old crank windows and she had no idea how to roll the window down. That was my first "how old am I?" moment. It looks great - but I bet it will look even better with a slightly smaller neck opening. I think it looks great. And if his head is anything like my kids, he could use the extra room to get it in the sweater. LOVE IT!! You've totally sold me on this sweater, I'm casting on right away!